Reno Updates | hi Sugarplum! If you’re like me, you get fairly invested in blogs…more specifically, a blogger’s home and life. (Megan said it quite nice in this post about how home bloggers are opening their homes, and therefore, their hearts.) So if my blogger friend (because if I’m reading that blog regularly, I consider them a friend) posts about a project, I think about it in my regular life. And if they don’t go back to the project for awhile, I wonder how it’s coming along. Granted, it was a fleeting thought, before your mind rambled down another equally fascinating path. So I’ll tell you what’s up with my Pool Bathroom Remodel. Let’s refresh, shall we? We started with this hot mess of a leak problem. My contractor busted his tail and gutted half the room, installed new tile, and even carved out space for new cabinet storage….in three days! 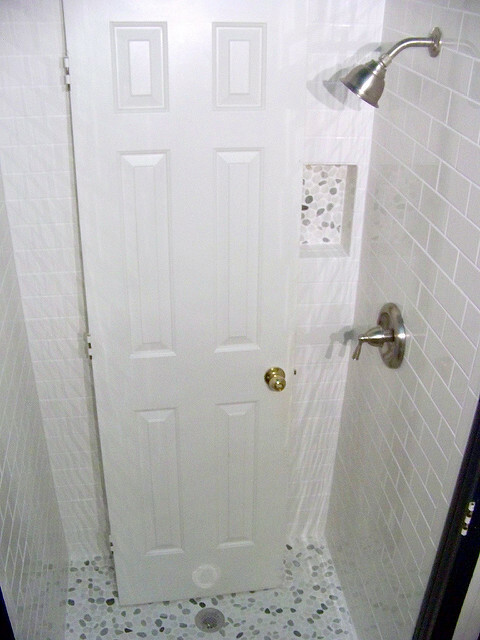 The original plan was to put the old shower door back on, but we realized pretty quickly that would look like doo-doo against our shiny new subway tile. So our genius contractor found a glass guy able to make a frameless shower door for half the cost. Whoop! Whoop! 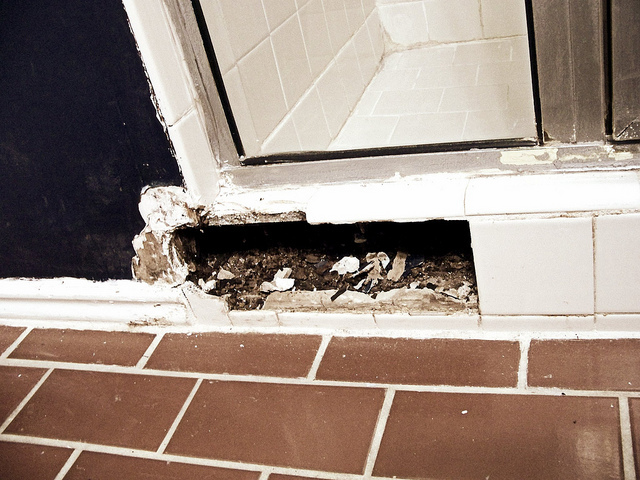 Unfortunately, we’re now on his time frame….which means this is what the shower still looks like, two months later. Womp Womp. 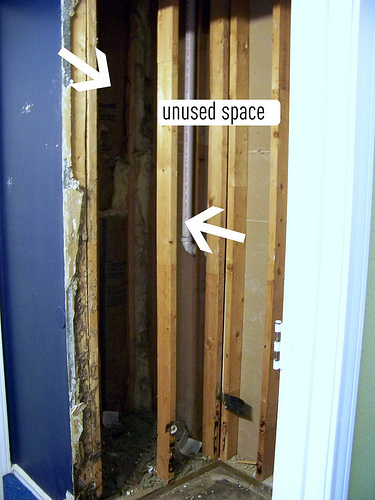 That’s the door to the bathroom sitting in the shower….just waiting for the new glass to arrive. Three days to remodel and two months to order a shower door. No bueno. But I didn’t really want added chaos in the house during the holidays, so I didn’t press the issue. I’m pressing now, and that shizz is on the way! So hopefully within a week’s time I’ll be able to tell you how the pebble tile feels underfoot! As for Part Deux of the renovation, Mr. Rock-My-Socks-Off Contractor enclosed the pass-thru from our Living Room to Den. Yeah, in that same three day period he was working on the bathroom! Too shallow to call this life changing? Well, some attentive readers wondered what the other side of the pass-thru looked like. It started as a sweet 80s wet bar. Don’t you just hear “She’s My Cherry Pie” radiating off this space? In six years, I used this spot for drinks once. So out came the mirror, sink and cabinet. And in came a little desk nook. A little on the dreary side, but we love the usable space. It’s almost like adding a room on to the house! Yes, there’s also a new wall color. 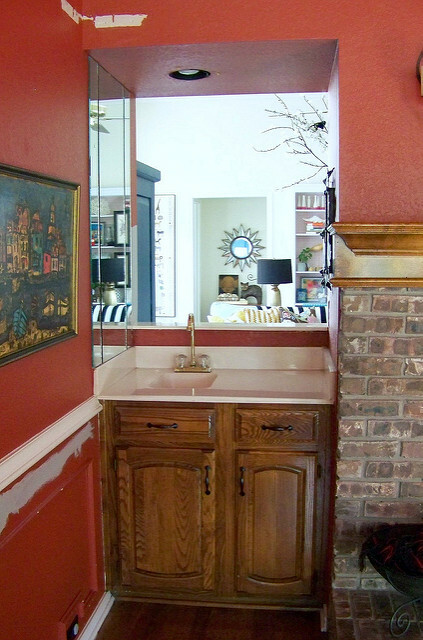 My painter works just as fast as the contractor…which happens to be faster than I can blog! I’ll get to it someday eventually. 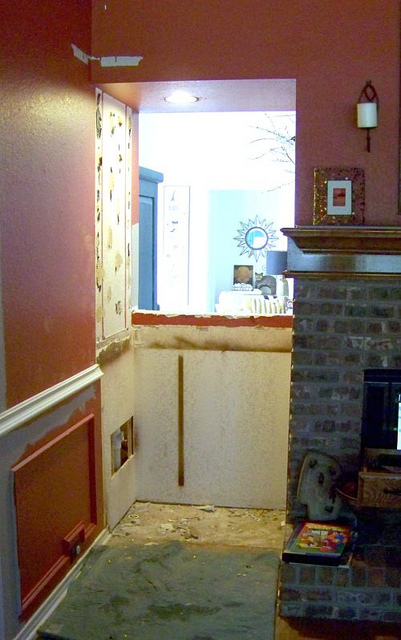 Any new projects cranking up in your house? Please tell me I’m not the only person who thinks about bloggers and their homes, even when I’m away from the computer?! Love the work space nook! love what you did with the wet bar! we had one of those in our first house in louisiana- it was in the family room and it was big! it even had a mirror behind it and glass shelves UGH. i took the mirror down at least when we painted the room, but UGH. i cringe just now thinking about it. Thanks for sharing your home and your heart. 😉 I have so many projects I want to start on our house…but next in line is having our electrician and remove our "intercom system" from the 70's, and our drywall guy to patch the holes. Then, and only then, will I be able to start painting the bedrooms. Always waiting on something! I know those glass doors will be amazing and worth the wait. Thanks for the update! I have a few bloggers I love to check up on! Love all your contractor nick names lol! Great work looks fantastic. 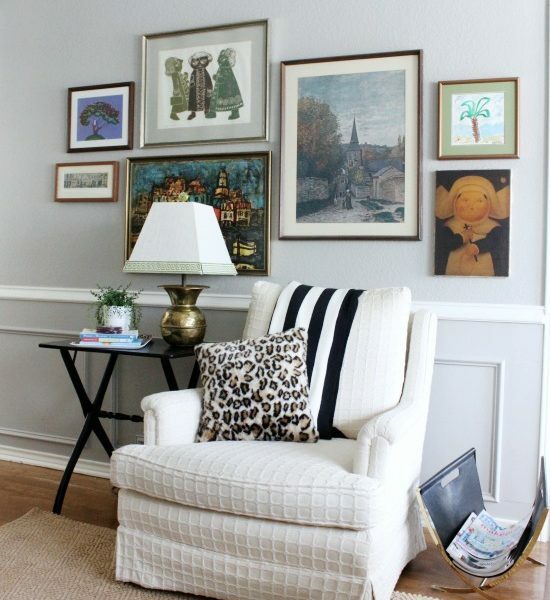 I love that your not rushing to style the nook. NICE!! Dang, you've been busy, girl– esp with the holiday-interruptus. 🙂 Thanks for sharing! How flippin exciting! I can't even tell you how jealous I am of your new shower. We talked about having ours redone the first day we walked in. It has now been almost 3 years, and it's still in all it's nasty glory! But, I dream of a fab shower like yours! And, turning that bar into a work space and enclosing the passthrough was brilliant! Your restroom and nook look great; I feel like I have a continuously growing list of projects. We just finished the kitchen and now we're working on the adjoining family room. Thanks for sharing your home; I'm a fairly new reader, and I love your blog! I cant wait to see that bathroom all put together. BTW west elm is having the bed and bath sale right now. I can see some of the grey striped goodness looking FAB in this bathroom. it looks great! even with a door sitting in it! LOL and LOVE the new "nook" you should totally put some fun-funky wallpaper in it for a pop! I ran across some fun ones recently-let me know if your interested and I'll send you the links. I love everything you do in your home so I'm sure the finished bathroom will be amazing! Ooo-la-la the bathroom looks so pretty so far! I like the look of the pebbles and yes, can't wait to hear how they feel. The hole in the wall is way better and such a beautiful wall color. Love that you got rid of the wetbar! The house I grew up in my parents built right around when I was born, and we had a big wetbar with mirrors behind it, glass shelves, and a bar counter and swinging doors to boot (haha just like in a western movie!). Glad you were able to transform it into a usable space! I'm relatively new to your blog and hadn't seen the pool bathroom before, but I think it looks gorgeous so far. I love those pebble tiles! Also am a big fan of nooks. And no, you're not the only one. I love to see what other people are doing to beautify their homes. I'm doing a whole home renovation so I need lots of inspiration. That's the cutest little nook! 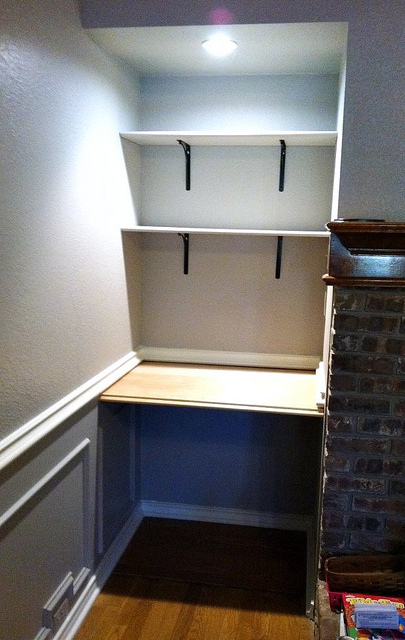 What a clever use of space tucked away like that! Thanks for sharing the 'in progress' shots! Hope you have a great day. So much better! I always think about bloggers homes, especially when I am out shopping for a client and I see something that reminds me of their home. It seems kinda weird considering I have never "met" these people! Love the little office nook!! We have a space like this off our dining/living room and it's perfect!! Great to see all of the progress . . .the new shower is so pretty despite it taking a while. And what a great idea to put the desk there. Crazy how a small space can really seem like a whole room addition when you can use it for something. Think I am updating on our projects tomorrow . . as I sit hear listening to drywall being installed! Fantastic! What an EXCELLENT transformation!! The work space looks great, as well as the bathroom. I'd be so happy to have those "hidden" shelves. 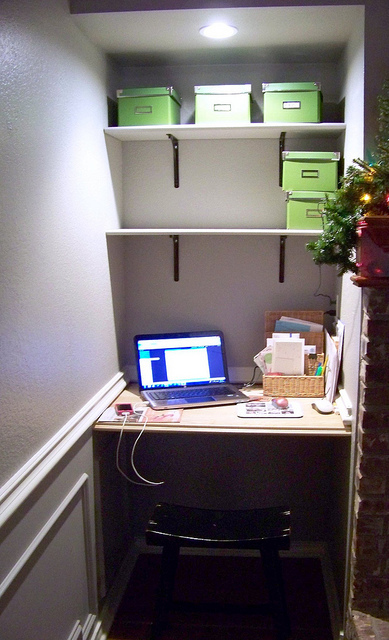 Love the little desk nook you created! We got the basement finished (well organized, painted, somewhat put together) before Christmas, but haven't touched it since. Need to get working on that since I promised pics eons ago! What an odd opening! Great use of the new nook! I have just started following and looks like you have a million projects going on at once and have great contractors!!! I honestly DID wonder about that pebble tile recently! Funny. The desk nook was a brilliant idea to maximize an awkward space. Haha. Just the other day I was thinking about your bathroom and wondered if I had missed the final reveal. I just couldn't remember which blog I saw it on. Love the new work space! And you will love the shower door!! In all honestly, I thought about your pool bathroom remodel this morning. How's that for timing! Can't wait to see how it all works out. The new little desk space is great, Cassie! Seriously a great contractor you go there! I was in fact wondering what you were up to over the holidays, haha 😉 Love that little office nook, useful nooks are just my fave. 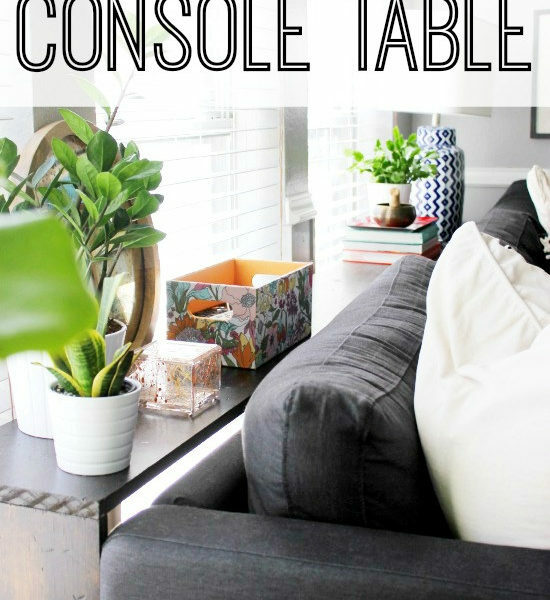 Reading this post made me start thinking about different options for your new desk area… I was thinking it would be pretty cute to hang up some curtains with a fun print or a stripe! I know my desk area gets Ca-Ray-Zay with papers/homework/random stuff, so it would be great to be able to camouflage it! Dang, that's some good shizz!!! What a great change for that space (the desk) and your contractor sounds like the shizz. And your shower is gorg, it just needs a door! Can't wait – way to score such a good deal on the glass. I heart frameless shower doors. Okay… can I just say you had me at "She's my cherry pie"??!!! Seriously – I laughed so hard I almost spit coffee all over the laptop! Hilarious. 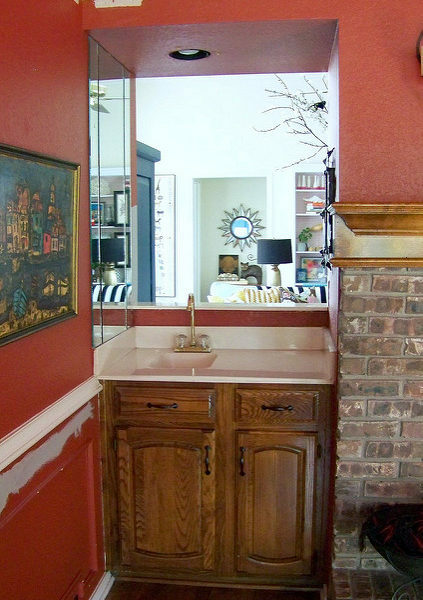 Love the remodels – that shower is to die for! You're not alone — I often wonder how various projects are coming along — your bathroom included! Sorry to hear about the update, but can't wait to see it all finished! And I love that desk nook. Looks like a good blogging spot! Wow! you are lucky to have people who work so fast, well, everyone but the shower door guy but if his prices are good, it's worth the wait. love the niche in the kitchen! can't wait to see how it all comes together. i blogged in august about my kitchen/downstairs remodel and am just now starting to get on with it. long story but hopefully by the end of jan/first of feb. it will begin. you might be interested in following it if you like that kind of thing. have a great day! Thank you for making me feel less like a stalker and more like a friend. 🙂 The bathroom looks great and I love the new identity for the wet bar.